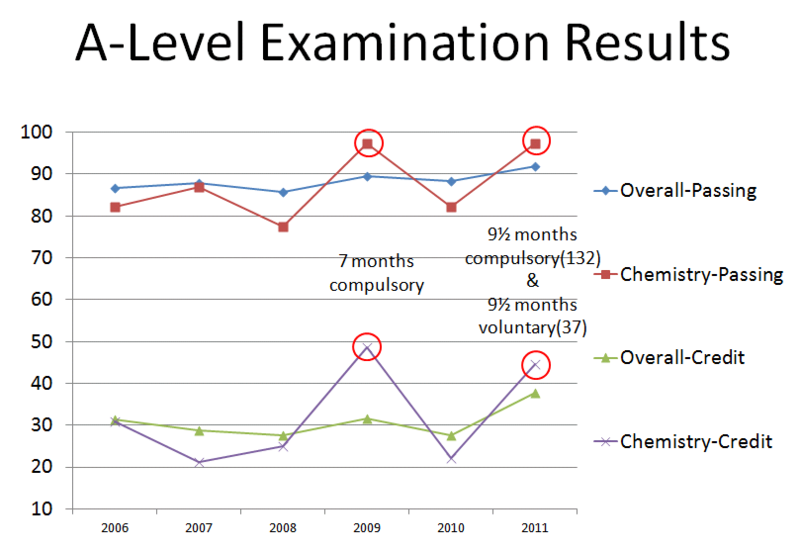 The same program was used to deliver the chemistry content to the students seating for the 2009 and 2011 chemistry A-Level examinations. The Chemistry students of 2009 did the program for 7 months in their form 7 on a compulsory basis. The passing rate and credit rate of the Chemistry improved by 26% and 94% respectively as compared with the result of the previous year. In 2009, the improvements in the passing rate and credit rate of the overall result are only 5% and 15% respectively. The Chemistry students of 2011 did the program for 19 months in their forms 6 & 7. The exercise was compulsory in form 6 but voluntary in form 7. The passing and credit rate of Chemistry improved by 18% and 101% respectively comparing with the result of the previous year. In 2011, the improvements in the passing rate and credit rate of the overall result are only 4% and 37% respectively. In the first half of the program (9½ months) where the exercise is compulsory, on average, each student did 132 exercises. In the second half of the program (9½ months) where the exercise is voluntary, on average, each student did 37 exercises. Considered the looming of the public examination and the fact that the students knew the improvement of the Chemistry subject in 2009, it was supposed that the students of 2011 would have a greater incentive to do more exercise in the second half of the program. However, this was not observed. This indicated that whether the exercise was compulsory or not was a determining factor in the average number of exercises done by a student. The change caused a 75% drop in productivity of the program. To reap the desired benefit of the program, the program should be conducted on a compulsory basis. Besides chemistry, vocabulary is the area chosen to be targeted because it just so happens that vocabulary is the lowest common denominator to all academic subjects taught in school. This will have the most direct impact on the overall learning proficiency of the students. Note : Actually, I have no objection to carry out the program on a voluntary basis provided that the choice is a well-informed one and all parents and students really understand the present situation of the school.